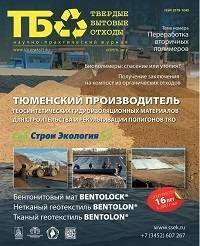 About Municipal Solid Waste magazine / Твердые бытовые отходы. Утилизация и переработка бытовых отходов. Вторичное сырье. Specialized monthly magazine Municipal Solid Waste is published since 2005 and is intended for waste management equipment suppliers/manufactures, waste management contractors/operators, health authorities, facility management, local/municipal governments, central government, waste management consultancy, financial institutions concerned with waste, trade organizations, associations, NGO’s, research or training establishment in the Russian Federation and CIS countries. The magazine presents information on the collection, processing and treatment of solid waste material, advanced technologies and modern equipment, conditions and development tendencies of the Russian and world solid waste management. Among our authors are leading Russian and foreign specialists who discuss issues of the day concerning application of modern equipment, production technology for solid waste management. The Municipal Solid Waste magazine is the member of the International Solid Waste Association (ISWA) from 2006. Domestic/household/consumer waste, secondary resources, waste removal, landfilling, waste generation, waste handling, waste processing, recycling, biowaste management, waste-derived renewable energy sources, product news. Our magazine has its own web-site (www.solidwaste.ru) that is not merely an electronic version of the hardcopy but offers a wide range of information resources and services to our visitors. Besides an electronic version of the last issue you can also learn of the next issue topics and see the archive of our publications. You can also make you subscription for all our editions here. Sites of all our Publishing House editions are interactive so after completing a simple registration and authorization procedure every visitor can, for example, place an article on the site, ask professional questions, participate in a forum and exchange opinions with other forum visitors. Our forums offer an excellent opportunity for communication. Easily obtaining any available information, you can also make your voice reach other members of the professional community. The Municipal Solid Waste magazine is distributed by subscription and by direct mail on the whole territory of the Russian Federation and certain CIS countries. Circulation of each issue in 2009 is 4500 copies. Volume is not less than 64 pages. Frequency -12 issues released annually. Subscription index in Russia and CIS countries - 64264 in the Pressa Rossii catalogue. Вывоз отходов и пр. мультилифтом. В наличии контейнера до 35 куб.м, грузоподъемность до 20 т.
Еще по теме "Лавсановая лента"
В Лисках ведется усиленная борьба с мусором / Новости / Твердые бытовые отходы. Утилизация и переработка бытовых отходов. Вторичное сырье.